WASHINGTON, D.C. -- U.S. Representative John Boehner (R-OH) was re-elected to the Speaker of the House today despite rumors among capitol insiders who were abuzz Wednesday about the prospect of Boehner (R-OH) being ousted from his position as Speaker of the House over his fiscal cliff compromise which raised taxes but did little to curb spending by a ratio of 42 to 1 in tax increases to spending cuts. 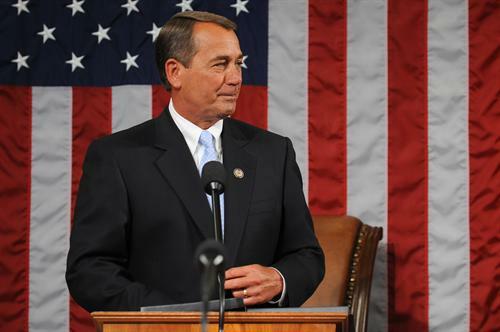 Republican House majority leader Eric Cantor (R-VA) was the rumored favorite to take Boehner's place. Outgoing Congressman Jeff Landry (R-LA) told Breitbart News on Wednesday that, "there are at least 17 GOP members who plan to unseat House Speaker John Boehner on Thursday, and Boehner may resign on Wednesday evening during or after a GOP caucus meeting." But Boener ultimately did not resign late Wednesday night. "They [conservative Republicans] could force a second vote [for Speaker of the House]. Anything could happen," Republican Congressman Bill Posey (R-FL) told Brevard Times late Wednesday afternoon. "Chris Christie is also pretty upset with Boehner over the lack of a vote for aid to Sandy victims." But Posey is not taking a hard line against moderate establishment Republicans. About one-third of House Republicans broke away from the party on Tuesday to join their Democratic colleagues to vote yes on the fiscal cliff deal. "I like RINOs because they are the reason Nancy Pelosi is not Speaker," Posey said. Posey voted for Boehner for Speaker today. Late Wednesday, The Hill reported that Boehner would cease private negotiations with President Obama to try to curry favor with conservative House Republicans.